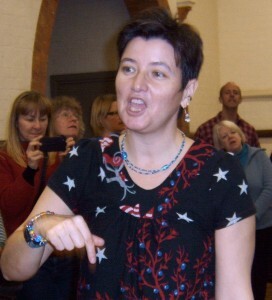 Sing The World is a Newbury-based a capella community choir, which has been running successfully now using Natural Voice principles (see below) for over a decade. We meet weekly on Monday evenings from 7.30pm – 9.30pm at Speen Parish Hall in Newbury, singing music drawn from a wealth of singing traditions from throughout the world. As we mostly teach songs by ear, to join us you don’t need to be able to read sheet music and there are no auditions – complete beginners and experienced singers are equally welcome. We aim to make our sessions uplifting, energising and inspiring – just come along and enjoy the harmonies! Our choir is open to all: if you’d like to join us then try a free introductory taster session (normal cost per session is £5). For session dates and more info see our Sing The World community choir web page, or contact us by email. At primary school we were lucky enough to sing every day in assembly, and have extra class singing sessions around the piano. I was also in the church choir in the village I grew up in and loved to sing on a regular basis. Life got busy for a while but the passion was re-kindled in my late twenties, when I got together with a group of friends in Newbury to share songs for the love of it. We also performed locally at birthdays and at other events such as Green Party and Friends of the Earth gatherings. We eventually grew in number and hired a hall to sing in; we also hired a Natural Voice Practitioner from Oxford to lead the group. My portfolio of songs gradually grew from attending this and many other workshops and Singing Camps all over England. I started to lead songs myself from about 2004. 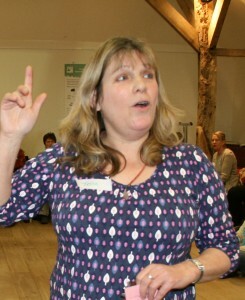 In 2010 I joined the Natural Voice Practitioners’ Network (Now NVN) so that I could benefit from being in touch with other teachers in the network and to share best practice and resources. There is a wealth of training on offer through this network which I have been able to take advantage of. At the end of 2011, I realised that I wanted start a more regular group and to work on some songs a little longer, although still for the joy of singing. That was when Sing The World came into existence in January 2012. I co- led Sing The World with Becca Flintham until December 2017, during this time It became a strong and vibrant group with a performing group ‘Wacapella’ as well. Becca has now moved on to Devon and I lead the choir. We perform occasionally. I lead a Saturday singing workshop once a year and Sing The World puts on other Saturday workshops led by guest teachers during the year too. Please go to our Singing Workshops page for more details. I thoroughly enjoy the wonderful singing community that we are part of. I believe that singing is something that everyone can join in with and that it is beneficial to health and well being to sing regularly. What is the Natural Voice approach? I have been singing for as long as I can remember, with my first inspiration being my mum who sang for decades with a village choir (The Heath Singers). I’ve sung so many different styles of music I’ve lost count… And I love ’em all! I first started singing with Sing The World over a decade ago, and have been co-leading the choir since 2007. I joined the Natural Voice Practitioners’ Network in 2010 and have been benefiting from its excellent ethos and support ever since… NVPN singers are a truly lovely group of people, and I never fail to be inspired by the way that singing unites and energises people and communities! When I’m not singing I also teach about nature, wildlife, farming and the environment.